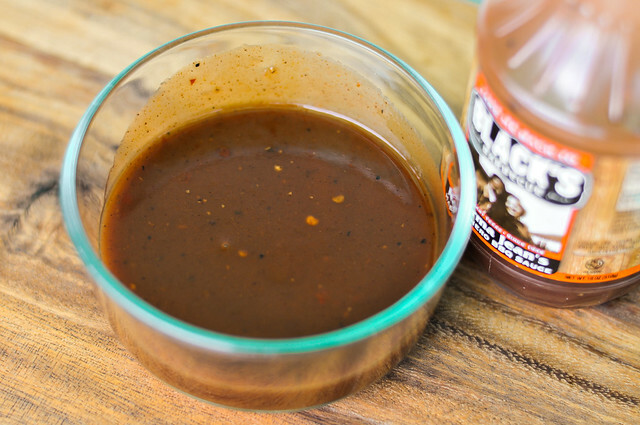 A deceptively mild mix of mustard, ketchup, and tomato quickly turns into a mouth of fruit heat that packs one hell of punch, making Black's Habanero BBQ Sauce a great layered and spicy sauce. I picked up this sauce during an amazing lunch in Lockhart that consisted of strops at Kreuz, Smitty's, and Black's. Of the three, Black's was the only one with sauce, and even then it wasn't by their design. 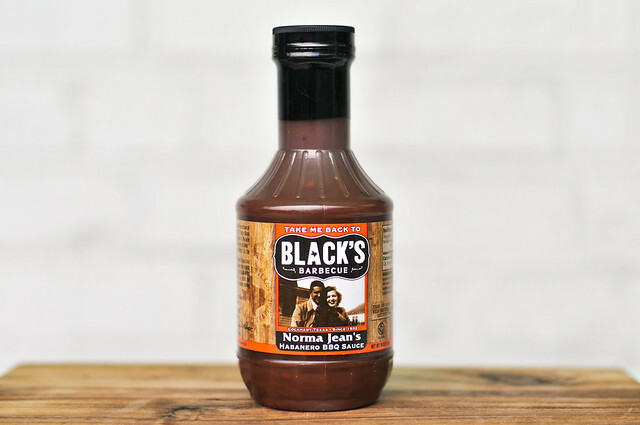 At it's start in 1932 by Judge Edgar Black, there was no sauce at Black's, but after having so many Northerns request it with their barbecue, Black's wife, Norma Jean, started working on a recipe. It took a year, but she finally perfected her sauce which is now served in four different varieties—original, smokey, habanero, and sweet. A big mustard tangy fills yours nose on the first whiff, putting it a bit at odds with it's more tomato-red appearance. There's strong fruity notes from the habanero sauce, with a detectable heat that's not quite as strong as the ubiquitous habanero aroma. This smooth, orangish-red sauce runs medium-thin. It drizzles smoothly in constant stream off a suspended spoon. There are a fair amount of visible spices, most prominent being pepper seeds and specs of black pepper. This sauce start with mild mustard tang that crosses over to a faint tomato with a slight sweetness. 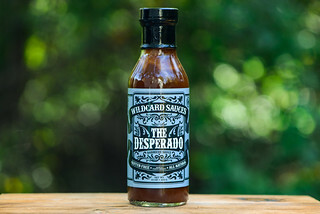 At this point the fruity flavor of habanero starts to boldly stand on its own, only to quickly switch over to a complex heat that's deceptively mild on the first spoonful, only to hit heavy on subsequent tastings—it left me with some heat induced hiccups by the end of writing this review. The sauce originally clung and coated the chicken well over indirect heat, only to burn off a bit over direct heat, requiring and extra basting at the end of the cook. Unfortunately the sauce lost a lot of its flavor after being cooked, leaving mainly just a spiciness in the end. It seemed as if the sauce was just there, not really doing that much to enhance the chicken. Out of the jar this sauce had very nice flavors ranging from mustard to tomato to fruity, all melding well in a sauce that rests between mild and bold until it heats the extreme heat of the habanero hits right at the very end. Once cooked, this excellent range of flavors diminished, leaving more to be desired. So Black's Habanero isn't much of a basting sauce, but as a dip or topper, it's pretty awesome. I'd love to add this habanero heat to a mess of freshly pulled pork shoulder, or drizzle on pork chops to add some great flavor to go with the mild, juicy meat. 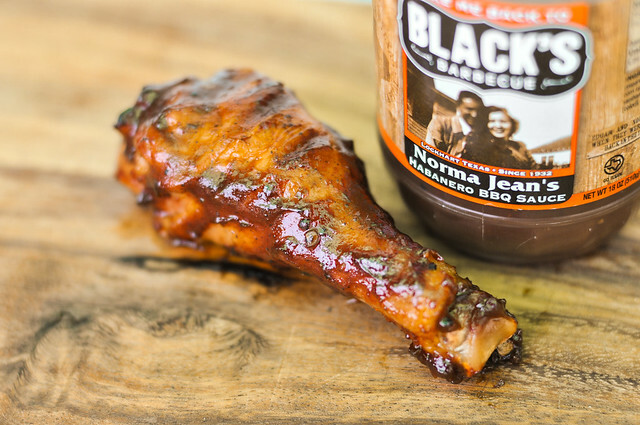 It's better at the actual Black's joint in Lockhart. Not a lot of people go for the spice of habanero, but I like the heat. I'm gonna have to try that out!